I love when one thing means something else. I love a story with layers. I love when things linger below the surface. I love metaphor so much that I don’t mind if I can’t understand what the metaphor is about and I’m left to fill in my own meaning. I want stories to be rich and full and brimming with metaphors that make me think and question and relate. When a metaphor is done well there is nothing like it, it fills you up and makes you feel as though art is real. It makes you marvel at a world where such perfection of wordplay can exist. However, where such a possibility of perfection lives, there must also be it’s opposite. Bad metaphor rips open the page and exposes the story’s innards. It jars you and dislodges you from the flow of the story making you feel as though you’ve tripped, fallen over the words and bruised your knee. Now the world looks a little different, a little more mundane then when you set out on your little journey. Maybe it was an inconsistent feeling that the metaphor gave off, or the wording was just a little too cliche, but either way you are trying to catch up to a story that is not as satisfying and that just won’t do. Avoid cliches. I’m pretty sure even saying this is cliche, but it unfortunately needs to be said. Sometimes I fall into the cliche trap and I’m lucky enough to have someone who loves me to pull me out. So find someone who loves you (or just about anyone willing to point out your flaws) and get out of the habit. Be consistent. If you are writing a story set in medieval times don’t use modern metaphors. Try to think about your characters, location, time period, feelings, themes and anything else that is a part of your story, then try to make your metaphors consistent with that. Use the imagery you have available within the scope of your story to expand and reflect exactly what you’re trying to say. 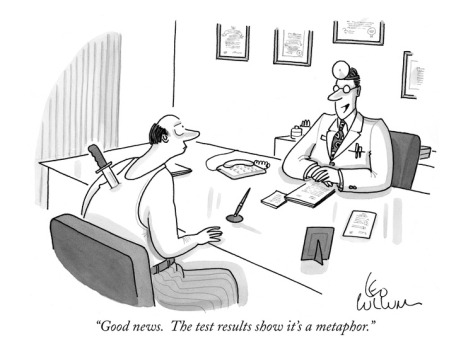 Go through and check your metaphors at the end, make sure they are consistent throughout. Symbolism matters. Remember that even if you don’t intend it, people will read more into your story than you may have put in. So start intending it. Leave easter eggs. Choose words, items, locations and people that mean something, that somehow reflect the themes in your story. People will find patterns no matter what, but if you put some of those patterns in there you get bonus points for awesome! Be accessible. If you use something completely abstract or rare your readers might find themselves removed. You want people to be able to vividly associate with whatever image or feeling you are trying to conjure. I reckon this is also based on your demographic and what kind of audience you are writing for. If you are just writing for your own enjoyment though, go wild! Experiment. This doesn’t have to be the flip side of being accessible, but if it is than that’s okay! Try things, be brave and bold and discover hidden meanings that you didn’t even know were there! Got more ideas on how to rock metaphor? Let me know!